Building antennas include outdoor tower-facing antennas and indoor phone-facing antennas. Every building amplifier system requires at least one outdoor and at least one indoor antenna. 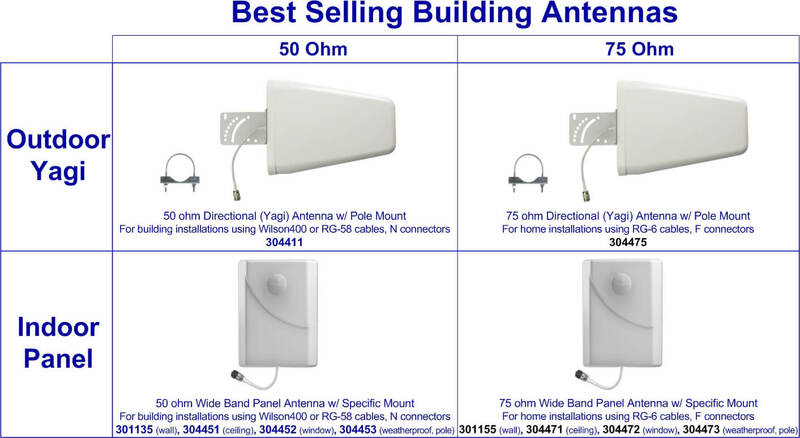 The following antenna choices are popular solutions for most residential and commercial installations. Wide Band Yagi Antennas is a powerful and the most versatile outdoor option. Its wide band coverage, easy installation, and attractive modern design make it our top seller. With maximum gain of 10.6dB on the 1900MHz band and average gain of 9.1dB on all North American bands. It includes mounting hardware for securing the antenna to a standard rooftop antenna pole or exterior building wall. Sufficient separation between antenna and building is recommended. An additional 10-inch pole mounting assembly (901117) exists to allow for mounting the antenna slightly up and away from the sidewall. The Wide Band Yagi comes in a 50 ohm variety with N-Female connector (304411) and a 75 ohm variety with F-Female connector (304475). The Panel Antenna is our most powerful and flexible option for indoor antennas. Its wide band coverage, multiple mounting options, and low-profile design make it most popular indoor antenna. With maximum gain of 10.6dB on the 1900MHz band and average gain of 7.7dB on all North American bands. The antenna comes with either a wall, ceiling, window, or pole mounting hardware. Separate mounts for wall, ceiling, window, pole, in-wall and corner wall are also available. The pole mounted antenna is weatherproof and suitable for patio or other outdoor applications. It is available in 50 ohm variety (N-Female connector) and a 75 ohm variety (F-Female connector). A convenient kit for an adding a second or third panel antenna to the popular DB Pro amplifier kit exists (301155-K1, 301155-K2). 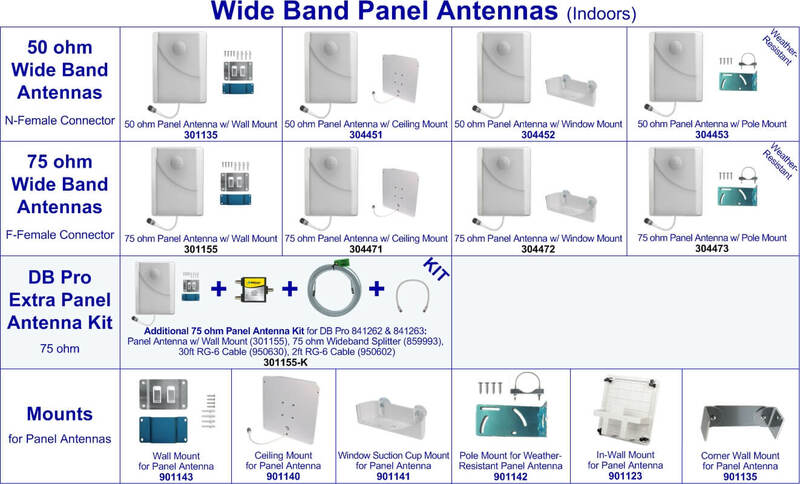 For convenient home installations, the following 75 ohm options are available: Panel Antenna with wall mount (301155), with ceiling mount (304471), with window mount (304472) and with pole mount (304473). For more advanced residential and commercial settings, the following 50 ohm options are available: Panel antenna with wall mount (301135), with ceiling mount (304451), with window mount (304452) and with pole mount (304453). Mounting hardware is also available separately: wall mount (901143), ceiling mount (901140), window mount (901141), pole mount (901142), in-wall mount (901123) and corner wall mount (901135).